My friend Abhaya is a movie buff who downloads movies from his satellite TV for viewing at leisure. He sends me a crisp message on WhatsApp recommending that I see it. Many of the older films that I have seen by purchasing DVDs are due to such recommendations from him. Some weeks ago, Abhaya send a message that I should see Everybody’s Fine. Finding that it had Robert De Niro and Drew Barrymore in it, I had immediately ordered for a DVD and after it came just kept it away and forgot all about it. 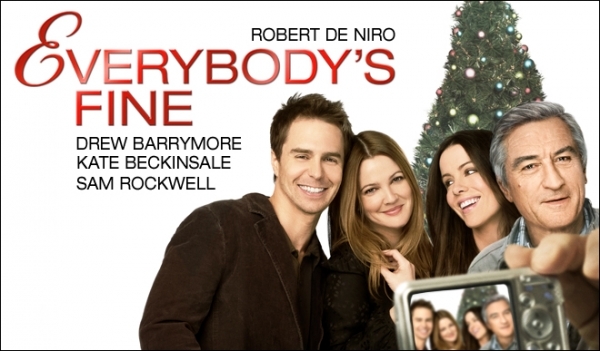 Yesterday, feeling like seeing a movie but not quite willing to get out of the house to go to a multiplex, I picked the top most DVD in my collection and lo and behold it turned out to be Everybody’s Fine. It is a drama film as its producers call it but I would rather call it a family drama. A retired widower’s discovery that his children have lied to him to protect him from himself under some impression that he will not be able to face and accept realities is the theme around which the story is built. There are many things in it that resonated with me but also some that did not. There are some scenes which could have been completely eliminated as they serve no purpose like showing endless shots of coated cable running alongside trains and highways to remind the viewer that the father had once produced those cables while giving a rough time to his wife and growing up children. Such pruning would have allowed for expanding the emotions involved in some of the reunion scenes which due to underdevelopment fall flat. Overall, a good movie to watch if one likes a bit of mush. Coming as it did more or less soon after my exposure to Cat’s in the cradle with a similar theme, it left me with a sense of satisfaction that I did not too badly as a father while my son was growing up. Worth a [rating=4] rating, possibly with half a star more which I am unable to put in. This entry was posted in Blogging, Family, Movies, Music, Relationships and tagged Cat's In The Cradle, Drew Barrymore, Robert De Niro. Bookmark the permalink. 10 Responses to Everybody’s Fine. but family angst is not usually my choice of movie… regardless of fine acting. i think i might pass. but i must say. you excel in reviewing films! it could almost be yet another profession for you! Thank you Tammy. I try. I loved your review, but like tammy will skip the movie. I like things with warmth and humor. I saw another one hyped as a comedy but which I can only classify as dark comedy. Due Date which I am not reviewing because I did not really enjoy seeing it. It seems quite common for children to lie to their parents to protect them from shocking realities, when they may very well be better at facing up to things than their children. The whole idea of “protecting” people in that way is a bit misconceived, not to mention insulting. I don’t “lie” to my parents. But, by golly, they do need to be protected from home truths. My youngest sister, the gaelikaa look-a-like, won’t have it. She has severed all ties with our father, and barely brings herself to be courteous to our mother. My mother who calls me of all her children “the faithful”. Great. If there is one good thing about the phone it’s that you can roll your eyes in despair and no one knows that you do [both – roll your eyes and in despair]. Anyway, film reviews. i don’t watch much. Though will admit that there are films which I have watched so many times I know them inside out and don’t (horror of horrors) don’t need to watch them any more. Which will come in handy should I ever land myself in prison. I’ll be on a roll – in my mind. This particular one was a bit offbeat for me too Ursula. It could have been handled better. I think that I missed on a different career! i come from a long line of secretives…my older sister is ace at it and I noted recently [actually she mentioned it] my niece has the gene as well when she was telling me “don’t tell Mum, exactly what happened, I told her it was bad bruising” – a chip off the old block me thinks! In our culture, we tend to be completely different and on the extreme other end. There is nothing confidential in our families. For instance I already know of a failing marriage of a young relative while she is still coming to grips with how to tell her parents!